I do like to use prawns for a curry. 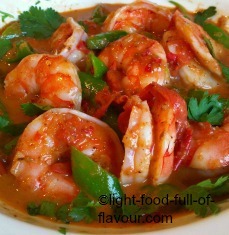 This is my take on a super-delicious Thai-style Massaman prawn curry. It might seem like a lot of ingredients but it is not difficult to make this curry, and it doesn’t take a long time either. Making your curries from scratch – rather than using ready-made pastes - is much tastier and healthier. You can make the sauce well in advance. The last time I made this curry for friends, I made the sauce the day before. It only takes a few minutes to finish this dish once the sauce is done. Tip: You can use firm white fish – cut into bite-size chunks - instead of prawns, or chicken. If you are using chicken, then choose chicken thighs as breast meat dries out quite easily. Add sliced skinless and boneless chicken thighs to the sauce first and simmer for 10 minutes before adding the sugar snaps. Once you’ve added the sugar snaps, simmer for a further couple of minutes. 1. Start by dry-roasting the coriander and cumin seeds, star anise, cardamom pods, cloves and black pepper corns in a frying pan over a medium high heat for 1-2 minutes until the spices start to become aromatic and a few shades darker. Once cooled down, split open the cardamom pods and place the seeds together with the other roasted spices in a pestle and mortar. Grind to a fine powder. Once done, mix in the ground cinnamon. 2. Place the spice-mix and all the other ingredients for the Massaman paste in a small food processor and whiz to a paste. You can use a stick blender as well – place all the ingredients for the paste in a high, quite narrow bowl and use the stick blender to make a paste. 3. Heat the oil in a large frying pan or a wok over a medium heat. Add the chopped shallots to the pan and fry for about 5 minutes – stirring frequently - until soft but not browned. Add all of the paste to the pan and stir-fry for 2 minutes before adding the diced tomatoes. Continue to stir and cook for a further 10 minutes – until the tomatoes collapse – then add the coconut milk, water and fish sauce. Bring to a simmer and simmer for 10 minutes. 4. You can, as I’ve said, prepare this well in advance. Let the sauce cool down, cover and store in the fridge Once you’re ready to finish off the Massaman prawn curry, get the sauce simmering again and add the prawns and sliced sugar snaps and simmer for about 3 minutes, until the prawns are pink and cooked through. Add the lime juice and coriander leaves to the curry before serving.